I said goodbye to the last of the yellow in my house over the weekend. The living/dining room was the final thing to go. Those rooms have been: Oyster (when we moved in), Pebble, some kind of mossy green, Ralph Lauren Stadium Red, and two different shades of yellow, over the last 22 years. I played with paint like it was a big box of crayons and now I'm ready for something clean and simple. And is it just me, or did the room get bigger? Seriously, it's like a magic trick. Valspar High Hide White, right off the shelf. Shaken and stirred. It had pretty good coverage but I still put on two coats in fear that this winter in direct sunlight my shoddy painting would come back to haunt me. I have a few details to finish up but do you remember what this room looked like before? 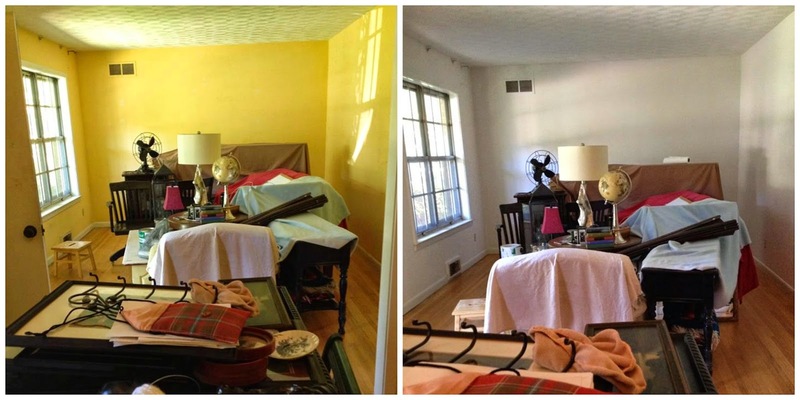 I liked the eclectic, evolved over time look of this room but the yellow was looking a lot more tired in real life than it does in these photos. I'm also in the mood to remove everything from my surroundings that doesn't have any special meaning. That means anything mass produced is headed for a yard sale this weekend and only original art, photographs, and items with some memory attached will be allowed to take up precious space. I'm over wanting the house to just look pretty. Now I also want it to tell a story. Rugs have been removed for the most part except for the den and guest room. The story our bare floors are telling is how hard our animals are on rugs. Why can't anyone ever throw up on the tile? Working on pulling it all back together and adding in some fresh projects and updates! Friday's post is likely to be a catalog of yard sale items.